Sargent Shriver was one of the most attractive, dynamic, and accomplished men of his time. 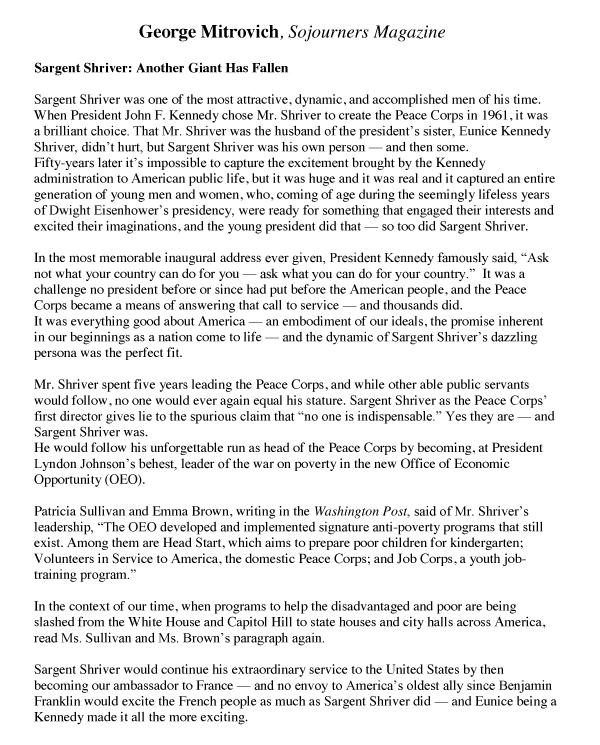 When President John F. Kennedy chose Mr. Shriver to create the Peace Corps in 1961, it was a brilliant choice. That Mr. Shriver was the husband of the president's sister, Eunice Kennedy Shriver, didn't hurt, but Sargent Shriver was his own person -- and then some. Fifty-years later it's impossible to capture the excitement brought by the Kennedy administration to American public life, but it was huge and it was real and it captured an entire generation of young men and women, who, coming of age during the seemingly lifeless years of Dwight Eisenhower's presidency, were ready for something that engaged their interests and excited their imaginations, and the young president did that -- so too did Sargent Shriver. In the most memorable inaugural address ever given, President Kennedy famously said, "Ask not what your country can do for you -- ask what you can do for your country." It was a challenge no president before or since had put before the American people, and the Peace Corps became a means of answering that call to service -- and thousands did. It was everything good about America -- an embodiment of our ideals, the promise inherent in our beginnings as a nation come to life -- and the dynamic of Sargent Shriver's dazzling persona was the perfect fit. Mr. Shriver spent five years leading the Peace Corps, and while other able public servants would follow, no one would ever again equal his stature. 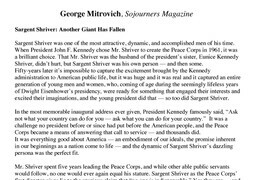 Sargent Shriver as the Peace Corps' first director gives lie to the spurious claim that "no one is indispensable." Yes they are -- and Sargent Shriver was. He would follow his unforgettable run as head of the Peace Corps by becoming, at President Lyndon Johnson's behest, leader of the war on poverty in the new Office of Economic Opportunity (OEO). Patricia Sullivan and Emma Brown, writing in the Washington Post, said of Mr. Shriver's leadership, "The OEO developed and implemented signature anti-poverty programs that still exist. Among them are Head Start, which aims to prepare poor children for kindergarten; Volunteers in Service to America, the domestic Peace Corps; and Job Corps, a youth job-training program." In the context of our time, when programs to help the disadvantaged and poor are being slashed from the White House and Capitol Hill to state houses and city halls across America, read Ms. Sullivan and Ms. Brown's paragraph again. Sargent Shriver would continue his extraordinary service to the United States by then becoming our ambassador to France -- and no envoy to America's oldest ally since Benjamin Franklin would excite the French people as much as Sargent Shriver did -- and Eunice being a Kennedy made it all the more exciting. When South Dakota senator George McGovern chose Missouri senator Thomas Eagleton as his vice-presidential running mate in 1972, no one foresaw the political disaster that would soon follow, as senator Eagleton was forced off the ticket. In the rush to find a replacement and minimize a damning political situation, two names quickly surfaced -- Maine's Edmund Muskie and Sargent Shriver. In the end, Mr. McGovern would select Mr. Shriver -- who once again accepted his party's call to serve. That didn't end well, for either of the two Democratic candidates, as Richard Nixon was overwhelmingly re-elected to a second term. Neither, however, did it end well for America, as Mr. Nixon would be forced from office in the aftermath of the Watergate scandal. Scott Stossel, Mr. Shriver's biographer, in an interview with the Washington Post, said, "It's hard to find another American figure where the disproportion between how much he accomplished and how little he is known is so large. For 12 years, Sarge was always at the center stage, or just off center stage, of American history." It's not easy to marry a Kennedy and hold on to your own identity, but Sargent Shriver did. Sargent Shriver and Eunice's marriage would form a powerful alliance in behalf of the poor and would help the world see the physically challenged in a new prism of pristine and transforming light. Without Mrs. Shriver's energy and her husband's unwavering commitment there might never have been a Special Olympics. In his passing at age 95, Robert Sargent Shriver of Maryland , and Eunice Kennedy Shriver of Massachusetts, leave a remarkable legacy. Not simply in their accomplishments and service to men and women the wide world over, but in their gifted children, who, like father and mother, continue the family's commitment to public life, of reaching out to the least among us and giving them hope. Their daughter, Maria Shriver, was most recently the first lady of California. Her brother Bobby is mayor of Santa Monica, her brother Tim heads Special Olympics, and Mark Shriver, who served eight years in the Maryland House of Delegates, now leads Save the Children. Now, Sargent Shriver is gone -- and another giant has fallen.